As promised I have added a base game compatible version of each of the lamps. They are in the appropriately labelled zip file. Please note that you must choose only one set - Base Game or Pets - as the GUID's are identical in each. The poly counts on the Base Game versions is identical to the Pets versions listed below. 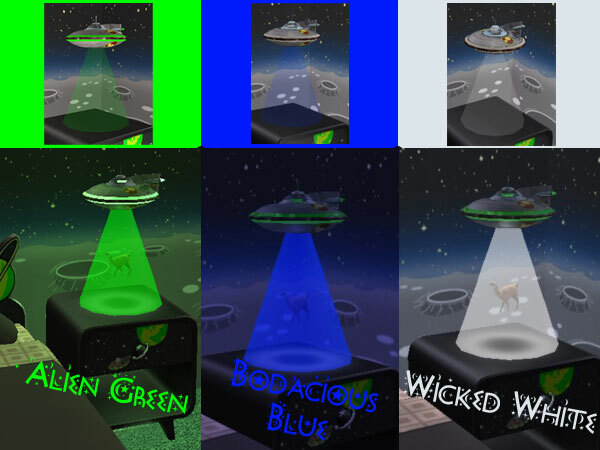 The Alien Abduction "Llama" Lamp is made from high quality metal and glass and comes in three great colors – alien green, bodacious blue, and wickedly white. It is available for your Sims for only 200 simoleons. 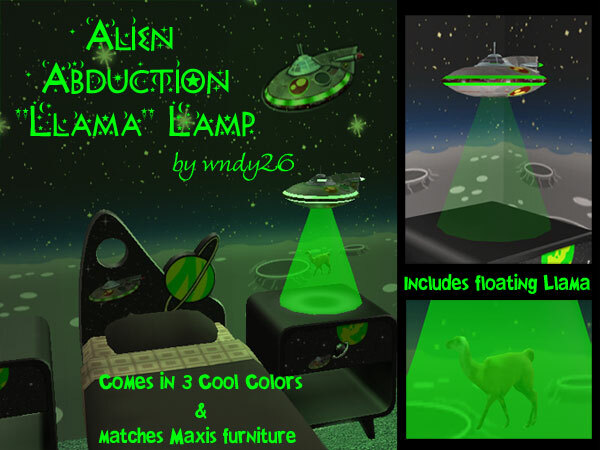 This lamp compliments Maxis wallpaper and bedroom décor for your sci-fi loving children! Pay close attention as you turn on the lamp - our llama mascot is being abducted by aliens! Llama mesh and texture graciously provided by Numenor, Lethe_s, and Boblishman. Alien craft mesh and texture are Maxis original. Animation is a work in progress and will be added sometime in the future. Please feel free to leave me comments! This one was real fun to work on. Lethe_s, Boblishman, and Numenor for granting permission to use their Llama mesh and texture in my lamp. Numenor for the CEP pack and his awesome instructions on working with lights. Phaenoh and Tig for encouraging me and requesting more than just green! Those involved in the making and maintenance of SimPE Delphy and the moderators of MTS2 for hosting and maintaining a great site. And last but not least – EA/Maxis for the Alien Space Ship and décor to match! Another extra thanks goes out to Phaenoh for testing my base game compatible versions! ***My usage policy on my main page shows a very lax recolor/reclone policy with exceptions noted on a per item basis - this is one object that has an exception mainly because I borrowed mesh and textures from others to complete it. So for that reason, I prefer that this item not be cloned without permission. Please PM me if you would like to clone it. Thanks.